Synopsis: The snow is deep in Maine’s Busman’s Harbor and the mighty rivers are covered in ice. Snowden Family Clambake Company proprietor Julia Snowden and her mother, Jacqueline, are hunkered down for the winter when a mysterious package arrives—heating up February with an unexpected case of murder . 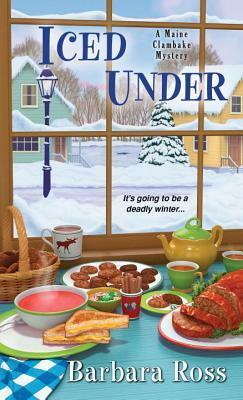 . .
My Review: Iced Under by Barbara Ross is the 5th in the Maine Clambake Mystery series. Once again, Julia Snowden is involved in a couple of mysteries, but this time, not in Busman’s Harbor. This is a fresh idea that really pulled me in to this story. It is February and there is an impending storm coming. Chris is off in Florida helping a friend set up his boat for the tourists so Julia decides to visit her mom. Jacqueline asks her to pick up her mail at the post office on the way. As well, Livvie is expecting to deliver the new baby anytime. When an anonymous, mysterious package that was in the mail is opened, a family mystery is revealed. As the story unfolds we learn about long lost relatives, family betrayals, tightly held secrets and a history that many would consider shady. This history helps us to understand Jacqueline and the life that shaped her. Once again, Julia uses her brain, her computer and her research skills to follow the clues and information to unravel the mystery of the “Black Widow”. There is a murder in this book, but it is actually secondary to the family mystery. Julia’s love for family and her moral compass push her to dig deeper to solve the mysteries. The new characters in this story are wonderful. They are accepting, honest and loving. The plot pulled me right in and I kept reading quite late in the night to finish this one and find out what happened. This book was much more emotional than the others in this series. When family is such an integral part of the story like it was in this book, it is easy to become more involved with the characters. The historical information imparted in the story was quite interesting and not something I had heard of before. I will definitely do a bit more reading to find out more. It was obvious to me that this had been quite well researched. This book took a different route than the others in the series, but was still just as good and entertaining as well. I am looking forward to what Barbara Ross has in store for us with her next book. The publisher generously provided me with a copy of this book via Netgalley.